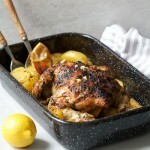 Oven baked lemon chicken: the best way to impress your dinner guests. Incredibly easy to make but I won’t tell if you don’t! Below text and the recipe by Samir Hajdarević. Oven baked chicken with potatoes and lemons is probably the first meal I conquered on my own (not counting the sunny side up eggs :)). And even until now, when I have moved from the ranks of a beginner cook, it stayed one favorite which I make with pleasure. It’s simple to prepare, and if we take away baking, it doesn’t take away much time, but it’s very appetizing. 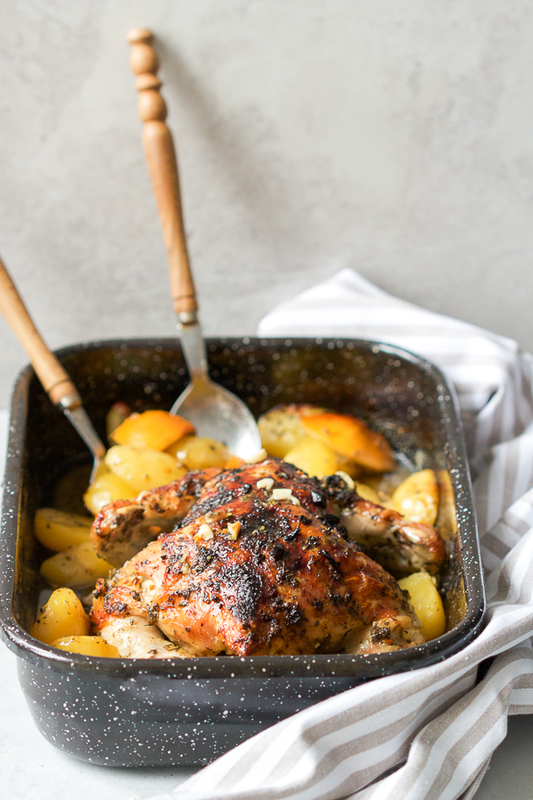 So, if you want a quick meal, to impress your dinner guests with the allure of culinary mastery, baked chicken with potatoes is an excellent choice. The magic of this meal, like many other things, comes from little tricks, small additions, that make the whole meal aromatic. Lemon took the role of today’s trick, making the meal rich with the taste of freshness. I learned to make this recipe as a high schooler, while my culinary knowledge was limited, as I’ve already mentioned, and didn’t expand beyond the knowledge necessary to prepare a simple breakfast. I “stole” it from a friend from school, while a few of us were hanging out. It was Sanchi, as we nicknamed him. One of my closest friends from that period. A sixteen, seventeen year old boy (then), like myself, with brown hair which, when it wasn’t fasted in a bun, fell to his shoulders in thick waves, and a not such a thick beard which he liked to trim to resemble Johnny Depp. He had a wide nest of things he was interested in, and was very mature for his age. Although not very tall, he was adorned with a dignified attitude, which overshadowed all others with ease. He was a person who captures. I believe this was one of the main reasons I liked to hang out with him in my free time. He also said the same for me, although I’m not sure whether out of politeness or not. Hanging out with Sanchi, I found many things out about myself and the world which surrounded me. That entire teenage period, a period of quick growing up, filled with trying out new things in an intense search for one’s self. 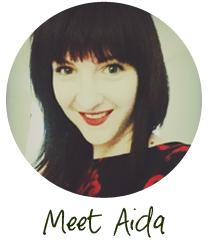 The search for new experiences, a passionate obsession for a period of time, that generally ended abruptly when we moved onto something different. But all of this plays an important role in development and leaving the boyhood and moving toward the world of grownups. Many tendencies are discovered and deepened here. Many of the interests I have even in this day started in those days with Sanchi. The love for acting was born as a consequence of Sanchi’s stubborn idea that we join the amateur theater. At first I didn’t want to hear of it, insisting it wasn’t for me, but after a while I gave in, and discovered I was passionate about it. Music also is another great passion of mine. The first chords I learned with Sanchi on a very bad guitar. Literature, painting, everything that I cultivated in childhood with Sanchi only deepened. Life later took us in different directions. We grew up. Received some new responsibilities that occupy and prevent us from remembering the past. That’s how it has to be. But here and there, doing something, some completely simple thing, something wakes up, takes our hand, and brings us back in time. It makes some people and events alive. Reminds us what we learned from whom. Wash and peel potatoes. Cut in half or quarters depending on their size. Place in a bowl with 1 tbsp seasoned salt, 1 tbsp parsley, 1 tablespoon basil, and 2 minced garlic cloves. Add a tablespoon or two of oil, mix well and set aside. Wash the chicken really well. Pat dry and transfer to a cutting board. Cut in a few places along the breast and legs (see the photo). Take the remaining spices (seasoned salt, parsley and basil), and smear over it on all sides really well. Take the remaining cloves and place in the orifices you made earlier by cutting. Wash lemons really well leaving the skin on. Cut into eights. 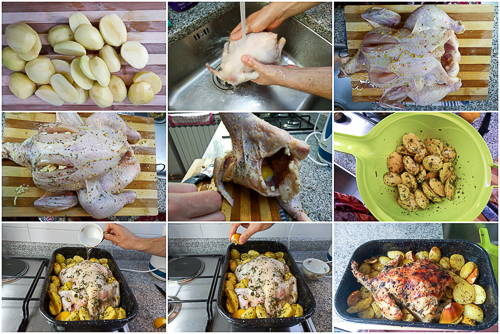 Place one cut lemon inside the chicken (as much as it will fit), and set the remaining one aside. Heat oven to 480F. 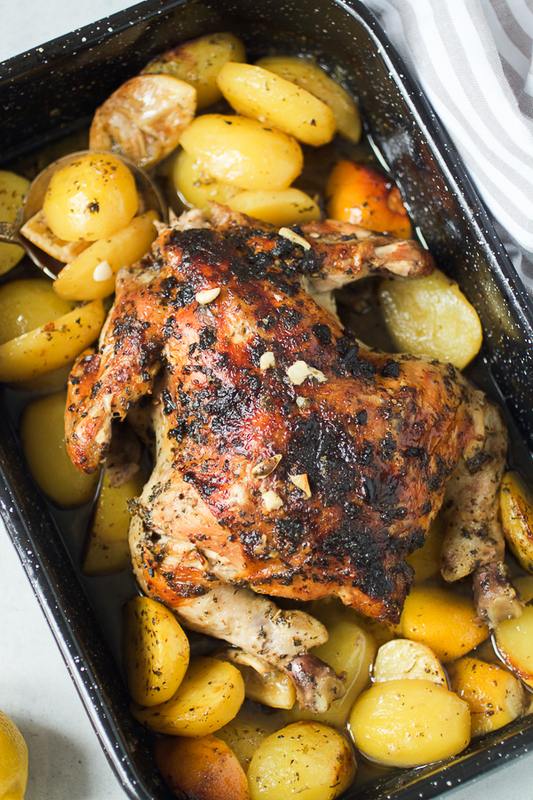 Generously oil a 9X13 baking pan, place the chicken inside, and spread the potatoes around it evenly. Oil the chicken and potatoes. Add one cup of water into the pan. Take the last lemon, and squeeze all the juice evenly over the chicken and tomatoes. Place the remainders into the pan. Place the pan into the oven, and bring the temperature down to 395F. Bake for 55 minutes or so, turning the chicken around once or twice. Bring the temperature up to 450F again, and bake for 10-15 more minutes. You may need a different sized pan – base it how on large your chicken is. This looks so good! I have never baked a chicken. Well, not a whole chicken. I find it intimidating for some reason. But this does look deliciously easy. Perhaps I can conquer my fear. AJ, I was the same exact way until this chicken. It really is that easy. Great recipe. Do you cover the pan when baking? Thanks Chep! Depends on the oven. For this recipe I didn’t. But if you notice the chicken blushing too fast, cover it with some foil and add a few minutes to baking. Then check if it’s done. If you have a baking thermometer stick it into a juicy part of chicken away from the bone, and turn off the oven when the chicken reads about 165F (about 75C). If you don’t have one, just check that the juice coming from the chicken is clear instead of pink. This was our Thanksgiving Dinner last year and it was a huge hit!